H. ergaster existed between 1.8 million and 1.3 million years ago. long low skull, with a brain size varying between 750 and 1225 cc. Early H. ergaster specimens average about 900 cc, while late ones have an average of about 1100 cc. The skeleton is more robust than those of modern humans, implying greater strength. Ex. Turkana Boy is tall and slender, like modern humans from the same area, while the few limb bones found of Peking Man indicate a shorter, sturdier build. Study of the Turkana Boy skeleton indicates that H. ergaster may have been more efficient at walking than modern humans, whose skeletons have had to adapt to allow for the birth of larger-brained infants. 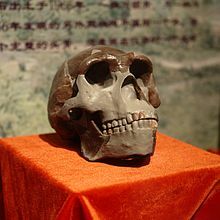 Homo habilis and all the australopithecines are found only in Africa, but H. erectus/ergaster was wide-ranging, and has been found in Africa, Asia, and Europe. Asian forms do not show the increase in cranial capacity. As a consequence of these features, they are less like humans than the African forms of H. erectus. Paleoanthropologists who study extinct populations are forced to decide whether there was one species or two based on morphological traits alone. They must ask whether eastern and western forms are as different from each other as typical species. If systematics finally agree that eastern and western populations of H. erectus are distinct species, then the eastern Asian form will keep the name H. erectus. The western forms have been given a new name: Homo ergaster (means "work man") and was first applied to a very old specimen from East Turkana in East Africa. Some researchers propose that these fossils might represent a new species of Homo: H. georgicus. Named in 1997 from fossils (juvenile specimen) found in Atapuerca (Spain). Dated to at least 780,000 years ago, it makes these fossils the oldest confirmed European hominids. Mid-facial area of antecessor seems very modern, but other parts of skull (e.g., teeth, forehead and browridges) are much more primitive. Fossils assigned to new species on grounds that they exhibit unknown combination of traits: they are less derived in the Neanderthal direction than later mid-Quaternary European specimens assigned to Homo heidelbergensis. Archaic forms of Homo sapiens first appeared in Europe about 500,000 years ago (until about 200,000 years ago) and are called Homo heidelbergensis. Found in various places in Europe, Africa and maybe Asia. This species covers a diverse group of skulls which have features of both Homo erectus and modern humans. mandible is human-like, but massive and chinless; shows expansion of molar cavities and very long cheek tooth row, which implies a long, forwardly projecting face. Fossils could represent a population near the common ancestry of Neanderthals and modern humans. Footprints of H. heidelbergensis (earliest human footprints) have been found in Italy in 2003. Homo sapiens, after 500,000 years ago. Ex. Change in braincase shape from more rounded in H. habilis to more angular in H. erectus to more rounded again in H. sapiens. The accumulating evidence of fossils has increasingly undermined a scenario based on three successive species or evolutionary stages. It now strongly favors a scheme that more explicitly recognizes the importance of branching in the evolution of Homo. This new scheme continues to accept H. habilis as the ancestor for all later Homo. Its descendants at 1.8-1.7 million mears ago may still be called H. erectus, but H. ergaster is now more widely accepted. By 600,000-500,000 years ago, H. ergaster had produced several lines leading to H. neanderthalensis in Europe and H. sapiens in Africa. About 600,000 years ago, both of these species shared a common ancestor to which the name H. heidelbergensis could be applied. Homo erectus in Asia would be as old as Homo ergaster in Africa. Do the new dates from Dmanisi and Java falsify the hypothesis of an African origin for Homo erectus? Not necessarily. If the species evolved just slightly earlier than the oldest African fossils (2.0-1.9 million years ago) and then immediately began its geographic spread, it could have reached Europe and Asia fairly quickly. But the "Out-of-Africa 1" migration is more complex. Conventional paleoanthropological wisdom holds that the first human to leave Africa were tall, large-brained hominids (Homo ergaster/erectus). New fossils discovered in Georgia (Dmanisi) are forcing scholars to rethink that scenario completely. These Georgian hominids are far smaller and more primitive in both anatomy and technology than expected, leaving experts wondering not only why early humans first ventured out of Africa, but also how. Members also differed from australopithecines and H. habilis in their increased, essentially modern stature and in their reduced degree of sexual dimorphism. This page was last edited on 9 December 2014, at 01:24.